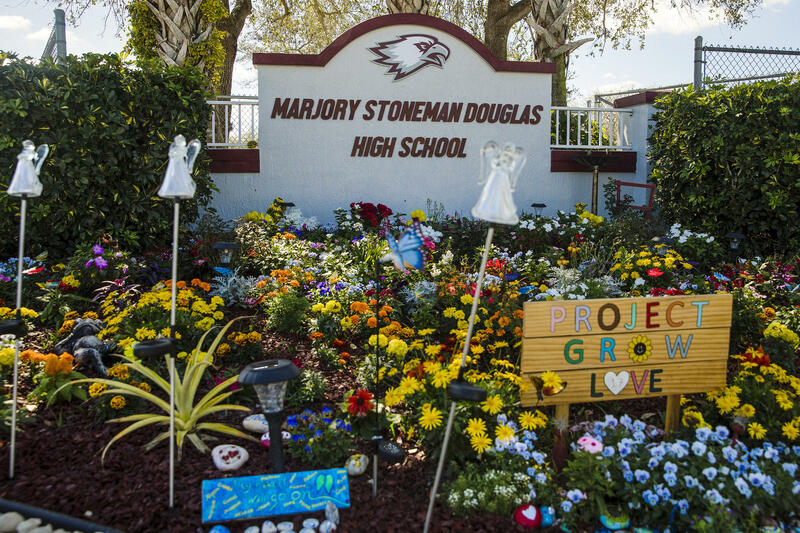 A memorial garden for the 17 people killed in the Feb. 14, 2018, mass shooting at Marjory Stoneman Douglas High School in Parkland, Fla.
Seventeen students and staff members were gunned down last Valentine's Day. Another 17 people were injured. The alleged shooter, a former student, is awaiting trial, and the state's attorney in Broward County, Fla., has signaled he is seeking the death penalty. David Hogg, now a Marjory Stoneman Douglas graduate, has become one of the most prominent figures in the March for Our Lives gun violence prevention movement. Since the shooting, young Parkland survivors have emerged as the driving force in calling for stricter gun laws in the U.S. through a series of marches, school walkouts and voter registration drives. David Hogg, now a Marjory Stoneman Douglas graduate, has become one of the most prominent figures in the March for Our Lives gun violence prevention movement. He was blunt when asked whether he has had time to grieve since the shooting. "The entire aspect of grieving and getting over something like this is bull****," Hogg told NPR Morning Edition host David Greene on Wednesday. "You don't get over something like this. You never can. You can't get over something that never should have happened." He pointed out that while Parkland gets a lot of attention, gun violence is a "preventable epidemic" in the United States. "This issue is beyond Parkland. This issue is about America and the war that we have on our streets, because it's time for us not to fight each other but to truly fight gun violence." Across Parkland on Thursday, a number of events are scheduled to commemorate the anniversary. Marjory Stoneman Douglas will have a nonacademic school day that will end at 11:40 a.m. Meanwhile, the Broward County School Board is sponsoring a "Day of Service and Love" that will include Marjory Stoneman Douglas students and staff serving breakfast to first responders. Marjory Stoneman Douglas senior and March for Our Lives co-founder Jaclyn Corin sits at the March for Our Lives office in Florida. Though Corin admits that at times she feels emotionally drained from all the ups and downs of the past year, she describes it overall as "monumental." As for March for Our Lives, the movement is planning to take time away from social media on the anniversary and the days immediately following it. "We don't know how we're going to feel," said Jaclyn Corin, a senior at Marjory Stoneman Douglas and a co-founder of March for Our Lives. Corin added that she and other Parkland survivors have been given advice from survivors of other mass shootings, including communities in Newtown, Conn.; Columbine, Colo.; and Las Vegas, on ways to prepare for the anniversary. "I think it's the proper thing to go dark — actually spend that day to ourselves in our own thoughts," Corin said. Though Corin admitted that at times she feels emotionally drained from all the ups and downs of the past year, she described it overall as "monumental." "The last year has been incredible for the modern gun violence prevention movement, and we've made so much of a dent on public opinion, and I think that's something to be proud of," Corin said. 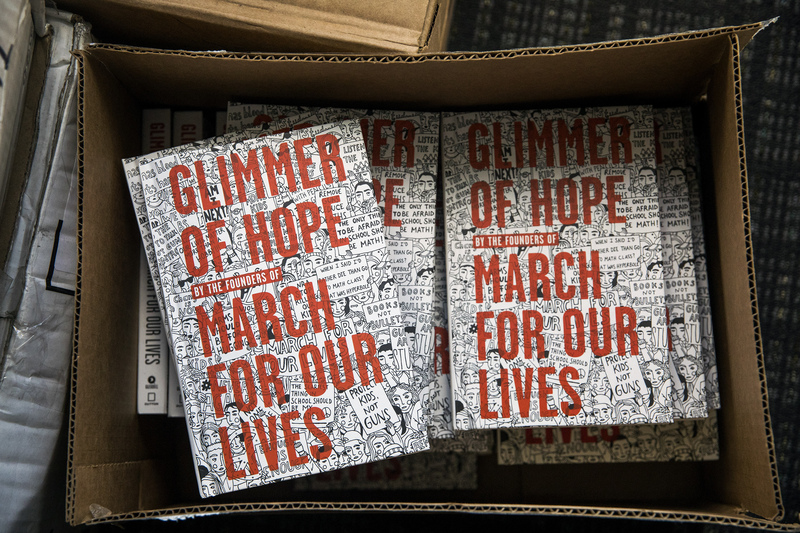 Boxes of books for sale at the March for Our Lives office. The movement is planning to take time away from social media on the anniversary and the days immediately following it. She points to a statistic from the Giffords Law Center to Prevent Gun Violence: It tallied 67 gun safety laws that were enacted last year across 26 states and Washington, D.C., following the Parkland shooting. Corin said it is nice to take a break from the activism to focus on "normal" aspects of high school. Part of her responsibility as senior class president is helping to plan the prom. She recently bought a dress and in a few weeks will tour the venue. 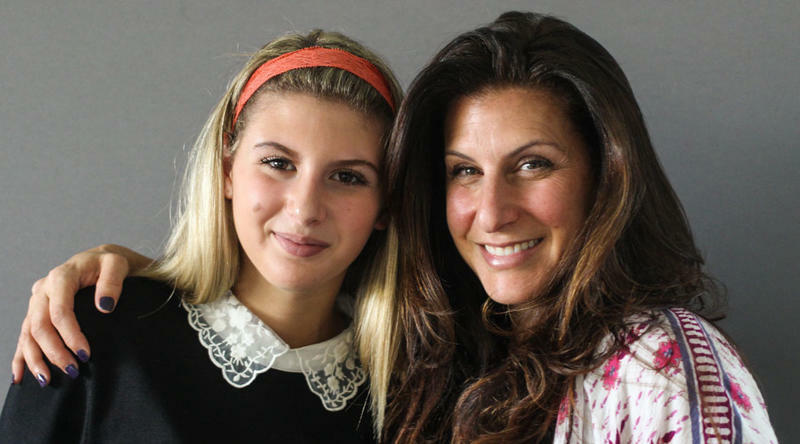 But the reminders of what happened at her school that day last year are inescapable. Corin tutored the alleged gunman, something she does not talk about publicly anymore. Then there will be talk among classmates about what life was like before the shooting and what it has been like after it. "A lot of people talk about the shooting like it's a time stamp," Corin said. Fellow senior Sarah Chadwick agreed. She described having to pass the campus building where the rampage took place. "The fact that the 1200 building is still there, it's actually incredibly difficult having to walk by it every single day," Chadwick said. "It takes a toll on your emotional state, and it's not even a place that we can avoid." March for Our Lives co-founder Alex Wind and Marjory Stoneman Douglas senior and March for Our Lives member Sarah Chadwick sit at the group's office. Once their social media hiatus ends this weekend, March for Our Lives activists say they have no plans to stop organizing or recruiting in the months to come. She said that it's a feeling that only those who were present on that day can understand. "There's definitely comfort being surrounded by people who kind of know what you are feeling and have been through the same thing as you." Once their social media hiatus ends this weekend, March for Our Lives activists say they have no plans to stop organizing or recruiting in the months to come. Congress is considering legislation requiring background checks on all gun sales and the majority of gun transfers. It is likely to pass in the Democratic-controlled House but faces an uncertain future in the Senate, which is led by Republicans. Alex Wind, another co-founder of March for Our Lives, said his primary focus is on making further gains in the gun violence prevention movement. "I think what's really important is that we keep this momentum going throughout this year and next year and throughout every year to come." 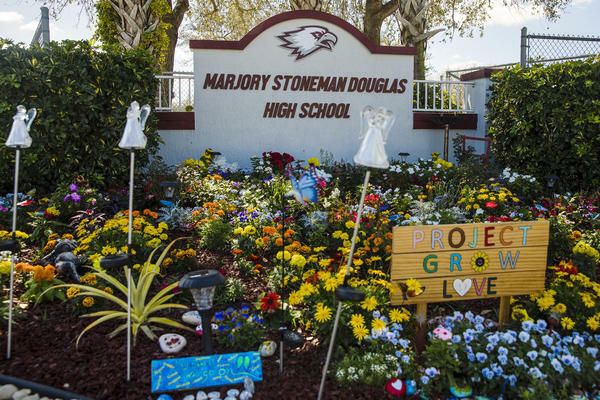 Well, for many survivors of the Stoneman Douglas shooting, the past year has been filled with a range of emotions. Student Jaclyn Corin is still trying to find balance in her life. As class president, she's responsible for planning senior prom. As a co-founder for March For Our Lives, she is also busy trying to build a gun violence prevention movement led by young activists. UNIDENTIFIED PHOTOGRAPHER: Turn your chin a little more to your left. There you go. BOOKER: ...Or on stage in front of thousands. Here she is just five weeks after the shootings, speaking in Washington, D.C., at the March For Our Lives rally. JACLYN CORIN: Our elected officials have seen American after American drop from a bullet. And instead of waking up to protect us, they have been hitting the snooze button. But we're here to shake them awake. BOOKER: Eleven months later, that work continues. Corin invites me to the relatively new March For Our Lives headquarters in South Florida. She reveals some of the dangers that she and her young activist friends sometimes face when fighting for stricter gun laws. CORIN: Our first office actually - we had to vacate because, like, people found out our location and, like, threatened us, which was not fun. But now we're here. BOOKER: Despite that threat, 18-year-old Corin seems calm and in control, whether she's running logistics on how to bus 100 Parkland survivors seven hours to Tallahassee to lobby state lawmakers or typical high school things. BOOKER: That reference gets a hearty laugh from classmates and activists, Sarah Chadwick and Alex Wind. Hannah Montana was the Disney character who was a pop star by night and an ordinary high schooler by day, named Miley. There are parallels for Corin. She's constantly on her phone, firing off emails - even while we talk - as outreach director for March For Our Lives. She is also class president. One of her duties - finalizing details for senior prom. CORIN: It's kind of a double life in that you have to manage your normal high school self and also be this public figure activist. So yeah, I mean, we're ordering a bunch of decorations. We're touring the space next month. BOOKER: She says it's necessary to focus on normal high school activities. It's hard sometimes, though, still being a student at a place where so much pain, so much grief and so much loss hover over school life. CORIN: A lot of people talk about the shooting like it's a timestamp - before and after the shooting - your life before and your life after. It's very hard to have a normal high school experience while we still go to Stoneman Douglas. I mean, that's just what the reality is. BOOKER: Perhaps adding to this burden for Corin, she had spent time with the alleged gunman. CORIN: I don't want to talk about it. CORIN: I used to talk about it, but now I don't want to. Yeah. BOOKER: Sarah Chadwick, a fellow activist, quickly changes the subject and shares what it's like to have to frequently pass the building where the rampage took place. SARAH CHADWICK: I mean, as for school and the fact that the 1200 building still is there, it's actually incredibly difficult having to walk by it every single day. It takes a toll on your emotional state, and it's not even a place that we could avoid. BOOKER: Alex Wind adds it's a feeling only those who were there that day can understand. ALEX WIND: And it doesn't matter whether it's February 14 or it's November 6 or it's whatever day because that feeling is still there. It's every day. BOOKER: The fact that the shootings happened on February 14, Valentine's Day, is especially difficult, Corin says. CORIN: When I go to the grocery store and I see a bunch of flowers and chocolates and cards, it's just - no. We're never going to be able to celebrate Valentine's Day again in our lives. That's not a holiday in my book anymore. And just the constant reminder that everyone else is going to be happy and celebratory that day makes it even worse. BOOKER: Corin says, starting tomorrow and going through the weekend, the national March For Our Lives social media platforms will go dark - no hashtags, no calls to action, just a time to reflect and to grieve. But Corin says next week, it's back to work. CORIN: We would do this every single day for the rest of our lives because there are people that can't because their voices were silenced. BOOKER: She adds she and other activists have a moral obligation to keep fighting, so other students won't have to go through what they did a year ago. (SOUNDBITE OF RADIO-INACTIVE SONG, "BLUEPRINT") Transcript provided by NPR, Copyright NPR.